Obviously, pulling off this breath-taking display required an immense amount of planning, logistical consultation, and testing; a process captured by director Nina Meredith in the Intel film “Team in Flight”. Through Nina’s lens, we get a first-hand experience of the Intel drone team’s dedication, led by GM Natalie Cheung through uncertain weather conditions to realize their impressive digital light show display. Nina Meredith is an award-winning director in the branded content, commercial and documentary space. She has filmed in over 30 countries creating work for dozens of global brands, including ten hours of content for The Olympic Channel. Her work has been featured on ESPN, NBC Sports, Smithsonian Magazine, Huffington Post, The NYTimes, Vice and more. She is a winner of Cannes Lions, Clios, AICP Awards and numerous international nominations. We spoke to Intel VP Global Creative Director Teresa Herd about how Nina’s vision transformed this project, and with Nina on the excitement of shooting in fluctuating weather conditions, how she fused elements of cinema verité and more staged portraiture for the film, and how aspiring women directors need to take the most important step toward their dream careers by simply choosing to begin. What unique qualities did Nina bring to this project as a director? What were some of the highlights of working with her? 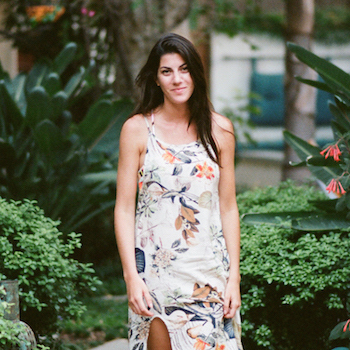 We chose Nina as a director because of her background in documentary and her filmic sensibilities. First and foremost, we seek to partner with storytellers who can move audiences to feel and experience something new. Nina’s amazing because she can practice her craft in the harshest of conditions. From the first sub-zero-degree day of shooting the last, she was unflappable. No matter how cold, how snowy, how windy or how late it was, she remained totally focused. It also helps that she’s just a lovely person who puts people who work with her at ease, not to mention the people she interviews. The subjects of the film were able to feel very relaxed with her, and that always brings out the best. Diversity in tech is something of a hot button issue currently – what are some of the ways in which Intel is working to provide opportunities in tech for women and people from diverse backgrounds? Intel has a very big diversity initiative across our entire business. This was announced last year. For us on the creative side, it is a core value in our hiring decisions. That goes across full time employees, contractors, talent, directors and artists. We always look for the best talent and that consideration includes what people bring from the broadest backgrounds. Nina was not the best female director we could find. She was the best director and she was a woman. 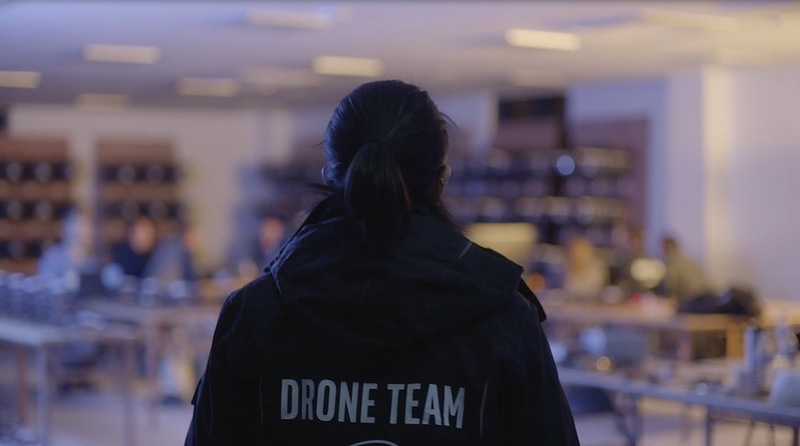 I was thrilled to work with her on this project as she brought the story to life and tapped into the team dynamic of the drone team in a way that we would not have gotten otherwise. She literally changed the dynamic of the piece because of the way she shot the film. 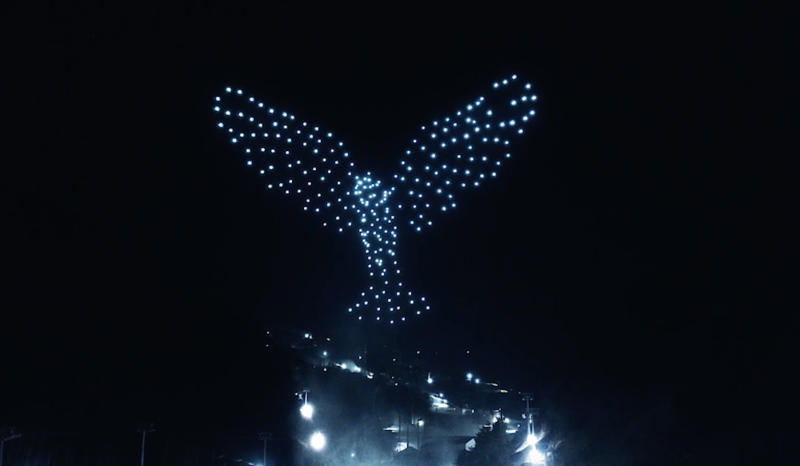 Your documentary-style footage following Intel’s drone performance at the opening ceremony of the 2018 Winter Olympics is gorgeous! Can you tell us about how you came on board and began working on this project initially? Thank you! I was first approached by Intel because of my experience directing documentary films for the Olympics. I was creatively inspired when I saw the brief. Though I only had a few days to turn around a treatment for the film, the unique nature of the project was so appealing, I jumped right in. The Intel team had such a collaborative approach and were open to my ideas from day one, which lead to a positive, dynamic relationship from the get-go. Having the opportunity to document history in Pyeongchang at the opening ceremony was a true highlight professionally and a creative milestone. How long were you shooting the footage that ended up in this final cut? We filmed in South Korea for nine consecutive overnights with five camera units. We knew we might only have one shot at filming the drone light show so we wanted to be prepared for anything and everything. What were the shoot conditions like? Can you go into some of the specific challenges you encountered during filming? The unknowns are what made this shoot so compelling and fulfilling. We went to South Korea as prepared as possible, but one major factor we had no control over was the weather. We were filming in freezing conditions which created a number of challenges. 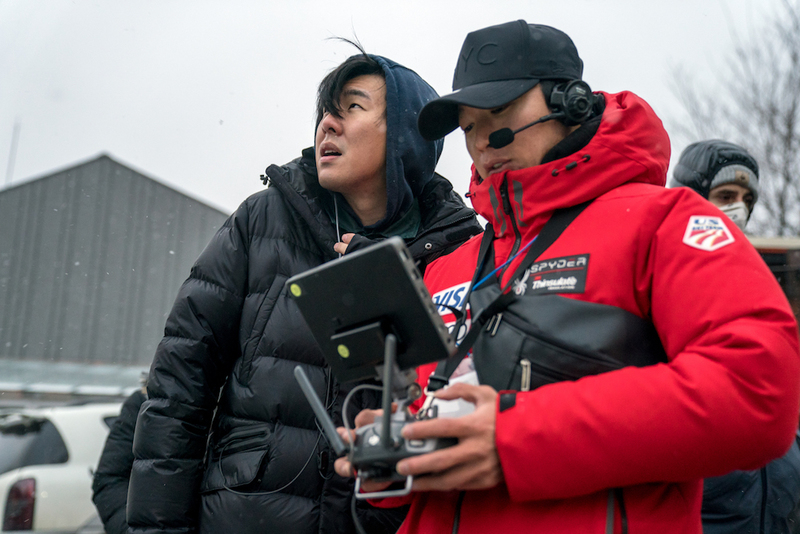 As Madeline Ong, PM of Drone Light Shows, puts it in the film, “The landscape here is cold, snowy, and icy with very high winds.” This posed the greatest challenge for the drone team to fly and as a crew, we had to be as reactive as possible. One particular night, the drones were about to fly and we had all of our camera teams in place, but then the winds picked up so we had to hold out for another five hours. I think this shoot was demanding not only in terms of the climate, but also in testing everyone’s mental patience and physical strength. My main goal was always to stay calm and positive when unpredictable scenarios arose so we could move with immediacy and professionalism. Luckily, I had a dream cast and crew so it wasn’t ever a problem. We loved the focus on the female Intel team members, especially Natalie Cheung. Did you know which team members would be the focus of the piece from the start of filming, or was it something that emerged as you shot? While the entire operation was a massive team effort, and we wanted to highlight the power of the entire Intel team, I knew I wanted to feature Natalie and Madeline in a stronger light. They are beautiful, bright and talented. It was important to show what they were capable of achieving, with the hopes of inspiring future generations. And yes, I love the fact that they are badass women running the show! It was an easy decision for both the Intel team and me because they represented everything the Olympics stand for: teamwork, dedication, hard work and having a very specific, unparalleled skill-set. What was your relationship with the film’s subjects like? What approach did you use in order to capture such natural, slice-of-life vignettes of the team? By the time I wrap a shoot, I like to feel as though I’ve known my subjects for years. I always strive to get to know my subjects and create a strong relationship with them before we begin filming, so I can conduct an authentic and impactful interview and also try to create a world that transports the viewer into the subjects’ lives. I was fully committed to being alongside the Intel team in experiencing their journey leading up to the opening ceremony so I could truly understand and capture the moments as they unfolded. Prior to filming, I sat down with both Madeline and Natalie days before we began filming to explain my vision and walk them through the storyboards and treatment. They were both immediately in agreement and gave me everything I asked for and more when we were shooting. There was a moment where we filmed Natalie walking past a shop window for over an hour and it must have been -15 degrees. I had her repeat the action maybe 25 times, but she was so patient and committed to giving me options, which was great. In documentary work, it’s important to know when to stand back and film verité style, letting a scene breath naturally. For me, it’s equally as important to choose and curate specific moments that will elevate the film visually or from a narrative standpoint. 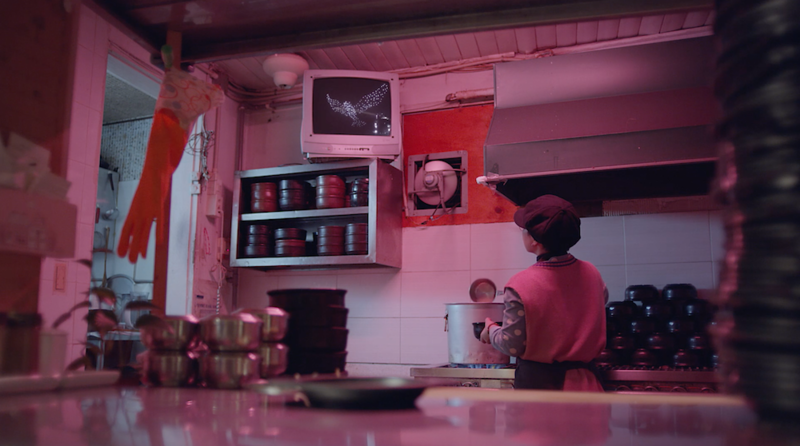 I love this hybrid of filmmaking where documentary approach meets anthemic portraiture. It’s a creative playground and I don’t think there are any rules or textbook guidelines anyone needs to follow. What was the most exciting aspect of working on this project? 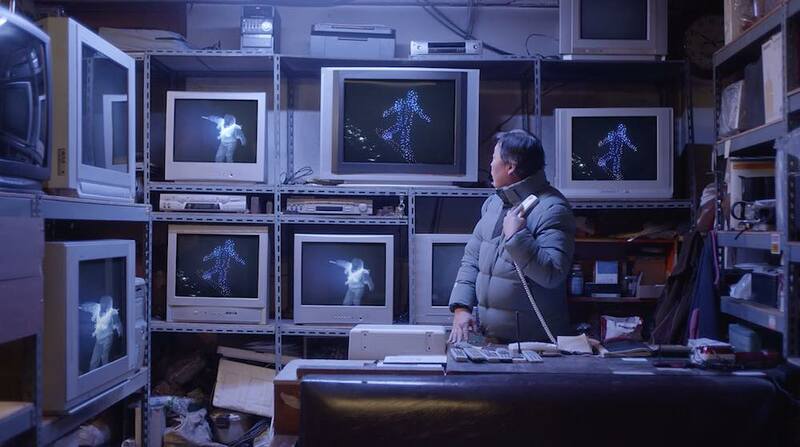 Seeing the drones form into these larger than life animations was watching magic in the sky. And I really like magic. I still don’t know how the Intel team pulled it off. I think the entire crew was mesmerized by witnessing a world-record breaking show in the making. The power created when art meets technology in the sky’s canvas was something beyond any expectation. I still have goosebumps when I think about it. And secondly, forming strong relationships with my clients, a group of people that I didn’t know prior to filming, was memorable. They are all such positive people and really trusted in my vision, which resulted in a successful product. And lastly, just having a really talented and committed crew. Shout out to my DOP, Soren Nielson, who was legendary- the image of him operating a movi on skis while chasing a snowboarder downhill will forever be a highlight of the production. There was truly no challenge he couldn’t sort out. Did this project allow you to flex any directorial muscles that were new to you? Was there anything new on the technical side of the shoot that you were particularly excited about? Absolutely! This was my first time working with 5 camera units plus a drone unit all at the same time. It was really empowering to be at the helm of it all. We had a strong gameplan every day on how to best approach the day’s filming objectives, and which camera unit would be responsible for what action. My DOP and I spent a lot of time researching the best cameras and lens packages that made sense to film in such challenging conditions at night. We also were constantly communicating on the ski mountain during the production and my producers were committed to enabling me to execute the vision in a very clean and creative way. Also, physically this was the most trying shoot I’ve been on. It takes stamina, and an ability to be physically and mentally focused for very long days and nights. How would you say this film relates to the rest of your body of work? What directorial hallmarks did you bring to the project? I like to approach all of my work in a slightly different way depending on what the project calls for, but I would say the throughline of my work is documenting a very real and human quality. I like to get deep. Whether I’m working with actors, celebrities, or ‘real’ people, everyone has a story and a journey that got them there and I thrive on creating a platform for them to share and a space for the viewer to empathize. It’s therapeutic for me. And I suppose my process is always the same. I always collaborate closely with my cinematographer and producers well in advance of any shoot. I find that the environment we can create from working together, trusting the process and learning from one another, truly is the most powerful means in creating opportunities and art. How did you get your start as a director? Was it something you were always interested in? What were some of your earliest film inspirations? I have always been an artist, but starting out I never really considered becoming a director, though I was always interested in documenting people in some format. My college film professor recently reminded me that all of my art projects in school were portraitures (of mostly females) on a very personal level within an intimate and comfortable space for the subjects. I believe that same interest and approach can be found in my work today. I then found my way into branded production and realized a bit later that directing was my calling. I have a lot to learn, but am so excited about the future. Cindy Sherman and Lauren Greenfield were my earliest inspirations whose work really turned me on to photography. I love their style, their ambition, their conceptual and demonstrative photography and how clear their vision is. Tell us about some of your past work that you’re most proud of, or that’s most indicative of your personal vision as a director. I love documenting athletes. Athletes have so much to give on set. But I never approach sports work as sports work. I like to lean in to the human quality of the subject and use the sport as their visual language. I can’t select one spot because I am really proud of all of my work for the Olympic Channel, Ecko and Nike. Certainly, directing the insanely talented Michael B. Jordan for Nike was a dream shoot. I actually ran into him earlier this week and he told me how much he loved the films. Those are the types of moments that drive me and make me feel confident (and proud) that I have found my profession and furthermore, my passion. What’s next for you? Any projects we should be looking out for? I head out to Italy next week for an amazing project. I am beyond excited about the subject matter which I can’t share in detail now but, I cannot wait to begin and share with you when I can. When we can truly create and embrace a world where complete diversity exists in filmmaking (and in life), the possibilities are endless. It’s such an exciting time, there are amazingly talented artists out there and I think we should continue to be committed to carving out a space for anyone that wants it. It’ll only continue to raise the bar, and push all of us forward. In closing, what are a few important pieces of advice that you’d like to pass on to aspiring women directors? I love these words from Nora Ephron, “I hope you will find some way to break the rules and make a little trouble out there. And I also hope that you will choose to make some of that trouble on behalf of women.” Just begin. Get out there and create, make and have a kickass time, however and wherever you can. Be (and love) yourself while also appreciating everyone else’s role and dedication.